This past week has been interesting with all of the rain showers popping up along the Alabama Gulf Coast. 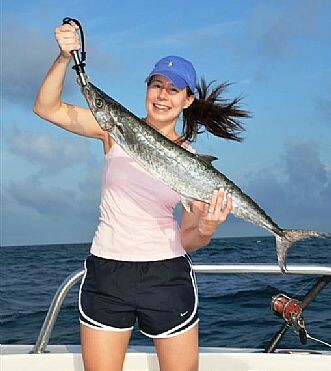 The beaches have been teaming with visitors looking for something to do because swimming on overcast days is not near as much fun as going deep sea fishing in Orange Beach with Distraction Charters. Even though the weather has been iffy, most days this past week we have been able to take advantage of the cloud cover and cooler water temperatures and have been catching trolling fish like King Mackerel, Spanish Mackerel and Mahi Mahi. The Red Snapper bite has been tough all week due to a strong surface current with a southwest wind. The water clarity has been tough until Friday,when we had a good push of blue water in toward Orange Beach and Gulf Shores. One thing for sure, the trolling fishing is good and should remain good through the rest of the month. Come see us. We would love to serve you.